This Greek orzo salad is made with cucumbers, chickpeas, tomatoes, red onion, feta and herbs, all tossed in a herb dressing. A simple yet hearty pasta salad that …... Take the lemon and zest it into the parsley, chicken stock. And cut it in half, squeeze half into the pan, cut side up to retain the seeds! Stir and let it reduce by about half! Cook the orzo pasta according to package instructions. In a large bowl add the cooked orzo, red bell pepper, onion, chickpeas, artichoke, olives, tomatoes, pine nuts, parsley, dill, lemon pepper and salt.... The perfect summer side dish: Orzo Salad with Roasted Summer Vegetables – it’s light and easy to make and absolutely delicious! ***Before we start – have you signed up for my email newsletters? Add the orzo and cook for 7 to 9 minutes, or according to the directions on the package. 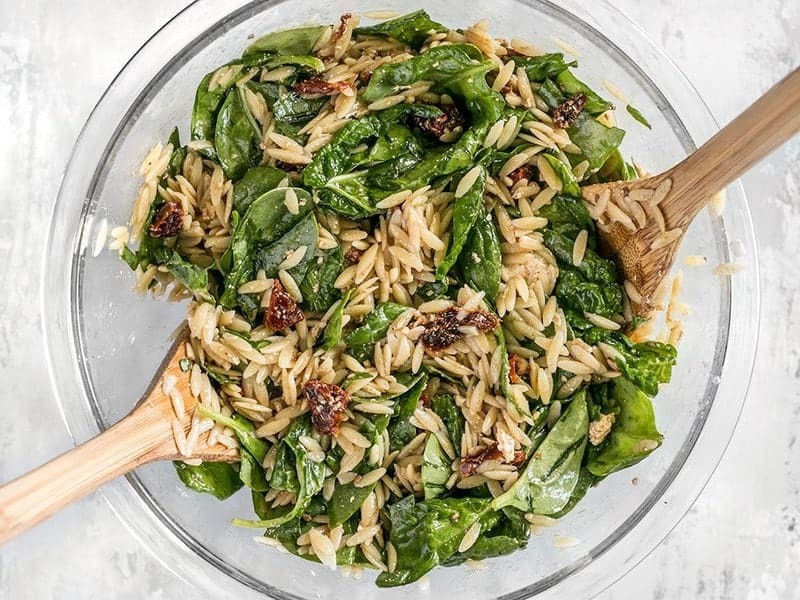 Drain the orzo in a colander, then add it to the vegetable mixture while the orzo is still …... Orzo is a fun rice-shaped pasta that adds a nice twist to meals. It can be used to substitute just about any grain and makes a fun addition to pilaf and risotto-style dishes but it really shines when added to salads. Greek orzo salad is a recipe I’ve been bringing to parties and cookouts for years, even decades, and it always disappears! You can’t go wrong with a combination pasta salad and Greek salad, full of black olives, feta, cucumbers, and lots of tiny, baby peas.... 1. Cook orzo in lightly salted boiling water for 8-10 minutes or until al dente. Drain and rinse in cold water. Drain thoroughly and put into a bowl. A: Orzo (pronounced “ohr-zoh") is a rice-shaped pasta; it also means “barley" in Italian. Because of the size and shape, orzo can be used in a fairly wide range of dishes -- hot and cold sides, soups, or salads. Cook 450 g of orzo pasta in lightly salted boiling water for 8-10 minutes. Add 4 cubes of chicken stock and 4 tbsp. dry white wine to the boiling water. Drain and add roasted vegetables. Garnish the dish with 2 tbsp. grated Parmesan cheese and serve warm. When it’s boiling, add the orzo and let cook, stirring occasionally, for 10 minutes. When the pasta is soft, yet firm, drain the contents of the pot through a colander in your sink. When the pasta is soft, yet firm, drain the contents of the pot through a colander in your sink.